New Zealand’s women cricketers achieved their first test victory at the 17th attempt (their male counterparts had needed 45). They had lost seven and drawn nine of their previous tests, all against either England or Australia. The match against Australia in Melbourne was the first women’s test played over four days. Previously, women’s tests were played over three days. After dismissing New Zealand for just 89 in its first innings, Australia had cruised to 109 for 2 by stumps on the first day. On the second morning, however, the New Zealand bowlers turned the tables. With significant contributions from medium-pace bowlers Pat Carrick (6/29) and Jill Saulbrey (3/45), New Zealand skittled the Australians for 129. Judi Doull (56) and J.E. Stead (95) then put on 104 for the first wicket. The New Zealanders amassed 335 and set Australia 296 to win. The Australians played slowly, hoping for a draw, but late on the fourth day they were dismissed for 152. Saulbrey (4/50) and Carrick (3/56) were again the main wicket-takers as New Zealand won the match by 143 runs. The team then travelled to South Africa for a three-test series. Two matches were drawn, but a 188-run victory in the second test at Durban gave the Kiwis their second international scalp in less than two months. 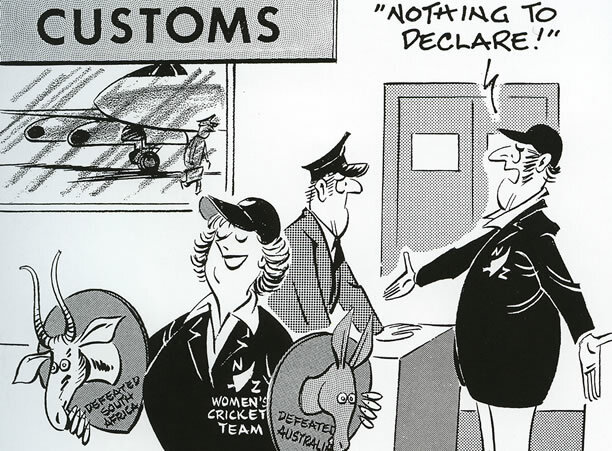 Meanwhile, the New Zealand men’s team was touring the West Indies for the first time. The Caribbean pitches were placid and all five tests were drawn. We have 16 biographies, 4 articles, related to Women cricketers triumph.